Of course we need to be able to program our lovely AVR devices, and it is best achieved with an in circuit programmer i.e. ISP. 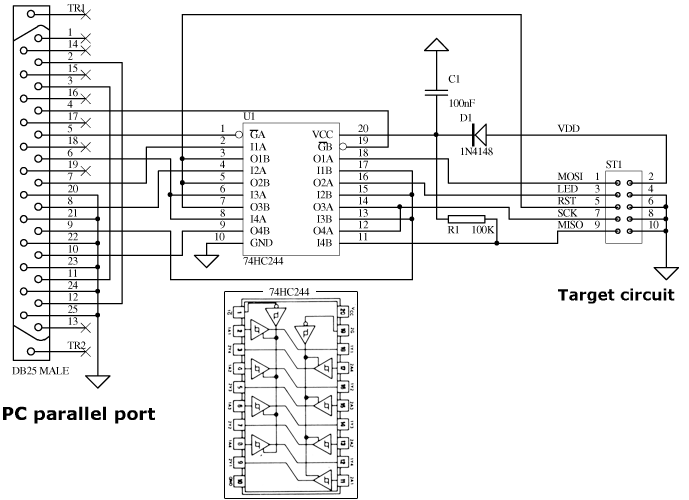 This programmer is equivalent with the STK200 programmer, which is used by the AVR kitt STK200, and supported by most or all programming tools for the AVR's. To use it with your programming software, you only have to tell the software to use its STK200 programming mode. It is possible to build a programmer using only resistors, but that would make it impossible to do ISP on 3V systems, this programmer will be able to do ISP on MPU's even in 3V systems, being powered from the target system. It is possible to put the programmer on a breadboard next to the processor as a temporary solution when you build your first project. The result of this is the second cheapest programmer possible! since no PCB is needed. You will of course probably find better prices for the components then I did, which only helps making it even cheaper :-) The plastic cover from elfa sux. D-sub-25 plastic cover (elfa.se, or use the one below) 33.70 SEK! 4.3 USD!